Am sitting in Starbucks now 'cause my home internet is down (again), and munching on a multigrain muffin. Multigrain, and I am only allowing myself 1 quarter of it. Because last night when we were measuring our luggage weight, we had to also face the deathly reality of our own weight. And I have put on 4 kgs!!!!!!!!!!!!!!!!!!!!! Anyway, I was looking through our pictures just now, or rather what I have with me, 'cause I think there are some in Jing's and Teeny's camera which they haven't passed to me yet. And at the moment, I have approximately 1,300 pictures!!! Can use as resources to blog for the next year WTF. We went to Little Flinders Lane for brunch. Teeny with her other weapon-- the DSLR wtf. This is Josh, Jing's bestie! And Jing in the background. Jing acting lady-like with her pinky pointed up but ended looking like she is picking her nose wtf. Schweppes! Teeny ordered some funky lemon flavor, which tasted, well, funky. HAHAHHAHAHA. To be fair to her, the burgers are super huge! Teeny looked sooo cute here!!! Like Puss in Boots, Burger Version WTF. Jing's dining etiquette, hahaha. This is not too disgusting considering it's coming from a girl who used to wipe oil from her french fries and spit out peas ('cause she doesn't eat them)! 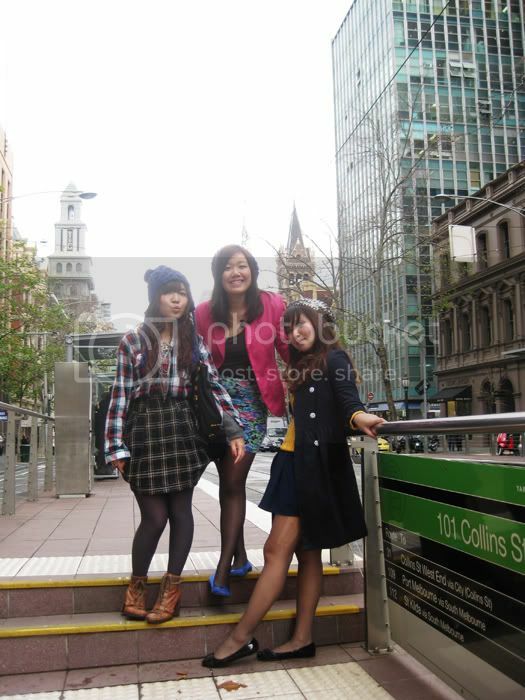 Collins Street, after perving at designer bags! Oh Chanel bag, come to mama! 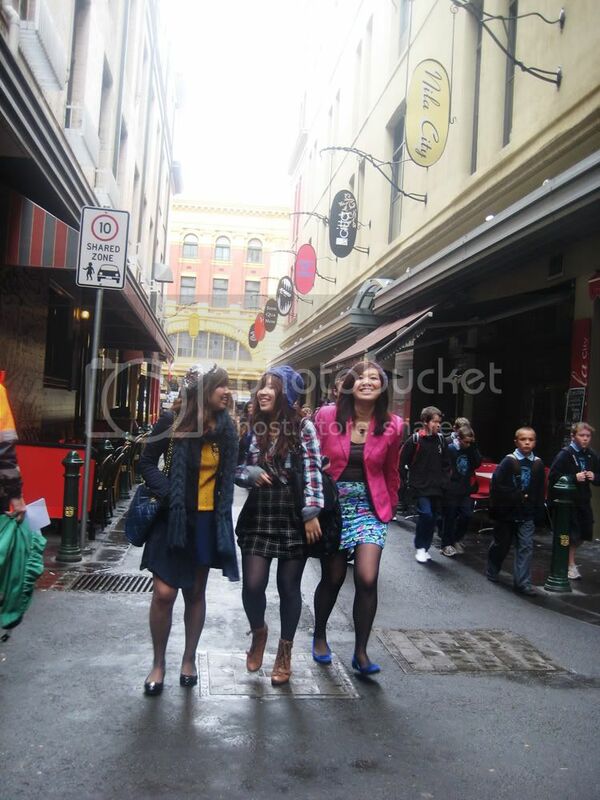 I *think* we were the most colorful people in the city that day, haha. There are three of us in this picture! Can you spot us! i was too excited that i commented on d previous post!!!! how can this b?? haha anyway i'll paste it here. not shy only??? i'm soooo super duper uber d excited dot com to c u here tat i can't help it but comment first before reading d rest of d entry!!!!!! faint dot come la me!!!! woohooooooooooooooo!!!! happy that u're back with lots of buys and tonz n tonz n tonz of picsssssssssss!!!!!! really can't wait!!!!!! most importantly, happy that u've d zeal to blog!!!!!!!! ok i better not get too carried away which i think i've already done it!!! 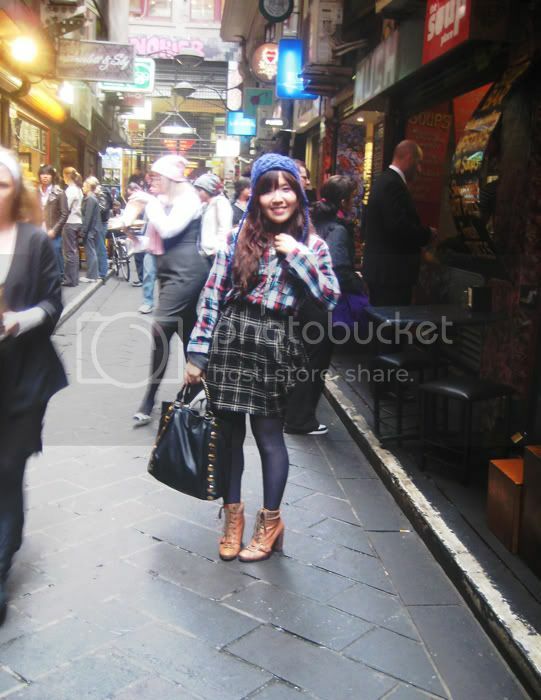 It's Flinders Lane, no "Little". mich: The anessa sunscreen is 60ml; I bought it in Nov and as at May or so, I still have slightly half a bottle left! regina george: My friends and I have always referred to it as that, habit!